Zatoxin Rinse is a medical device used in paranasal sinuses inflammation, rhinitis of various origins, before and after surgical procedures and prophylactically to maintain a proper hygiene of the nose and sinuses. 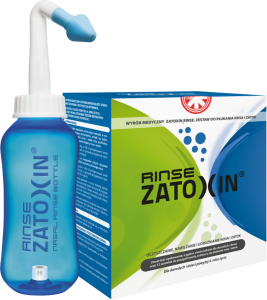 Zatoxin Rinse allows to thoroughly clean the nose and sinuses from secretions, allergens and pathogens, thus limiting the accumulation of infective agents. A unique construction of the Zatoxin Rinse irrigator makes it possible to rinse the nose and sinuses in an easy and controlled manner – without the need for additional force and squeezing the bottle. Composition of a sachet: sodium chloride, sodium bicarbonate. Package contents: an irrigation bottle (max. capacity 300 ml), a box of 12 sachets with a powder for a solution preparation, two tips for classic and mild irrigation, an instruction of use. Supplementary kit contents: 30 sachets with a powder for a solution preparation, an instruction of use. TACTICA Phamaceuticals Sp. with o.o. Before using the medical device, please refer to the supplied instruction of use, which contains important information about the method and conditions of its use.